The purple bag on the right is my workshop sample which I made a few weeks ahead of time so I could write down notes on measurements and order of assembly. 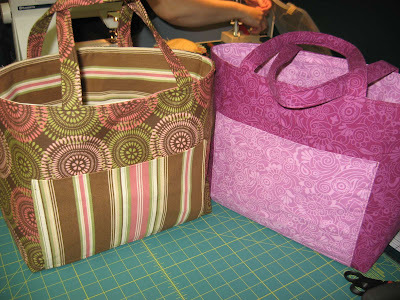 The bag on the left is the one Kerry made during our workshop. 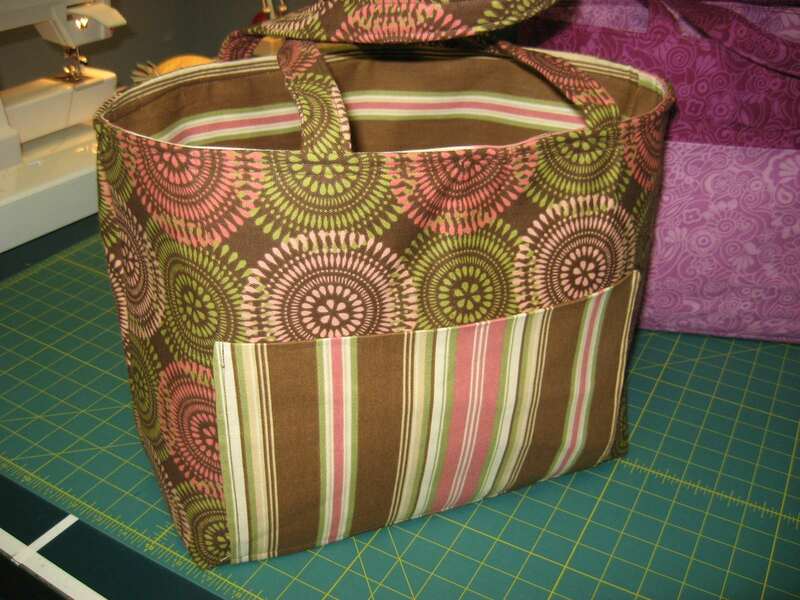 She chose a canvas fabric and peltex interfacing for her bag and I think it turned out just great! 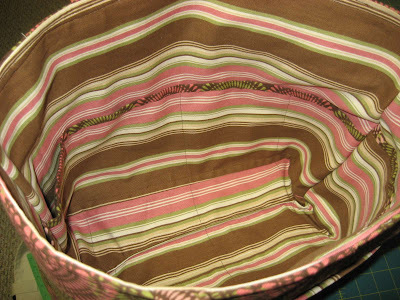 The inside is lined with the striped fabric and has pockets on both sides for storing and organizing lots of stuff. Don't you think this is a good looking bag? 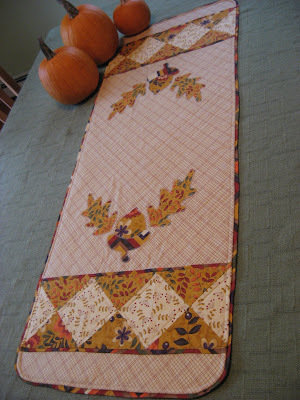 Kerry was a great student and worked hard to get this done in one sitting. Now she's practically a bag making expert, having learned just about all of my bag making tricks to use in her future bag making efforts! Great job, Kerry! Have you heard that New England dressed up as January for Halloween? Well, it's true! We really got dumped on here in the northeast! Our house was without power for only 17 hours so we were some of the lucky ones! There are still many thousands of homes that will be without power for another few days while the utility crews replace and repair downed transformers and reconnect homes to the power supplies. The public works crews have been working non-stop clearing downed tree limbs and whole trees that came down from the weight of the 12+ inches of heavy wet snow on top of trees that have not yet dropped their beautiful fall leaves. A bad combination all around! 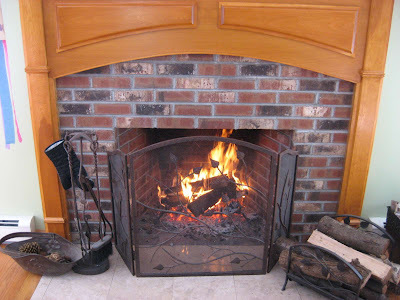 We stayed warm and cozy by the fire all day Sunday until the power returned around dinner time. We were very grateful for a cozy house with no tree damage and enough wood to keep us warm for a really long time, thanks to that ice storm we had a few years ago! To top that all off, our refrigerator died on us just before the storm arrived. We spent Saturday morning buying a new one and making arrangements for its delivery which won't be until tomorrow (Tuesday) because of the storm. So to get us through the four days without a big refrigerator, we picked up one of those little square ones like what you might find in a hotel room if you request a refrigerator in your room. We figured we could keep some milk and lunch meat and a few other small items cold. That plan was working just fine until we lost our power Saturday night! We had already thrown away every last thing from our big refrigerator and didn't want to lose what little we had in the small one, so my husband filled a cooler with snow and packed the contents of the small refrigerator into it and left it outside to stay cold! School was canceled for today and has already been canceled for tomorrow because of the lack of power to that section of town, and Trick-or-Treating has been postponed until Thursday evening. Once the new refrigerator is up and running and school is back in session, things should get back to normal, but I've still managed to make some progress on Karen's Postage Stamp Quilt which I'll show soon. I hope you are warm and safe and cozy in your home this week, with some stitching of one kind or another to keep your hands busy! Oh, do you bring back memories, but not good ones. We lived in Ohio for 13 years when we were first married and endured many snow and ice storms, power outages, black ice, and being dug out by the National Guard. 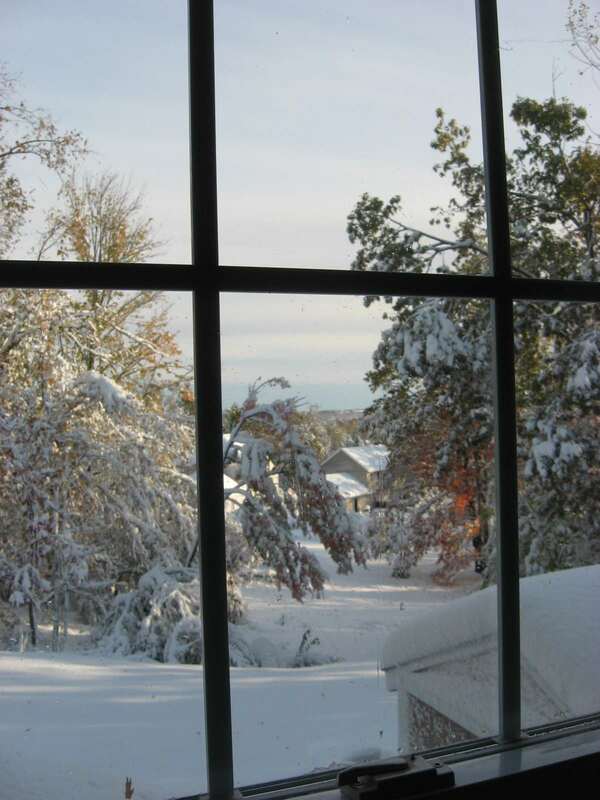 What is funny is that I have a son in New Haven an a daughter with family in Loveland, Colorado, that have both experienced October snow storms this year. What a coincidence! I'm glad you are keeping warm and getting some sewing done. Great job Kerry! 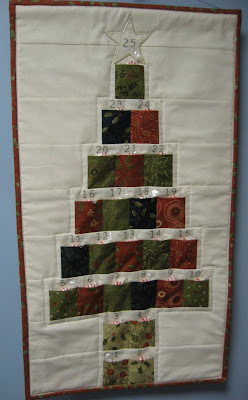 You had a GREAT teacher in Mary Grace...she could probably teach me how to sew...and I don't even know how. However, my friend Donna did help me sew a Tote Bag at her house for my sister...I couldn't believe that I made it! Mary Grace...I'm jealous of that BEAUTIFUL snow you had...I'm sorry so many are without power...glad you stayed warm and safe...send some to Ohio for me! Oh my goodness! You got a lot of snow! What a hassle to deal with the fridge - I bet you were thankful for the snow then;-). Stay warm. 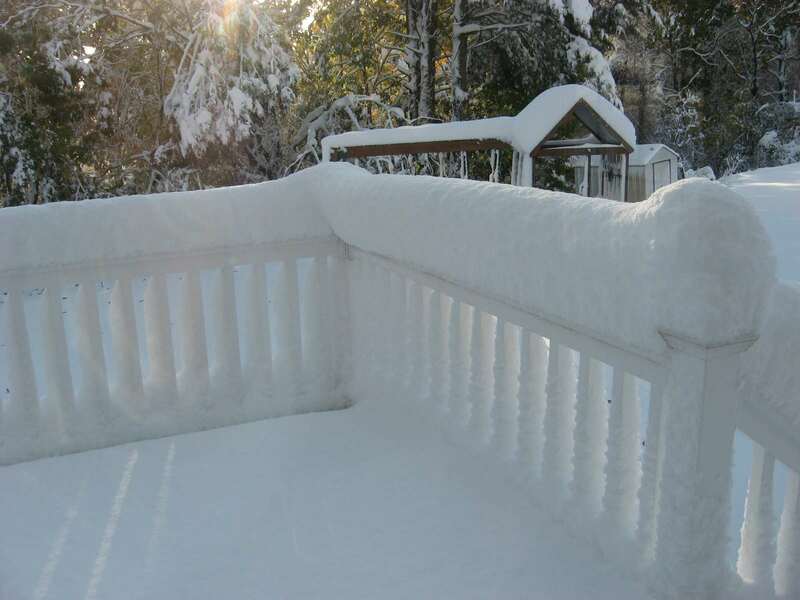 Oh my gosh - I had no idea you got that much snow so early in the season. I feel guilty as we are finally having nice weather here in Texas - no more 90's and it feels almost cool to me! Snow is beautiful, though, but not when you have to deal with no power and now frig on top of that. This is one Halloween you will remember - I suppose there was not tric or treating. Keep warm! I lived in NW New York as a child and we always installed large castors on our refrigerator. 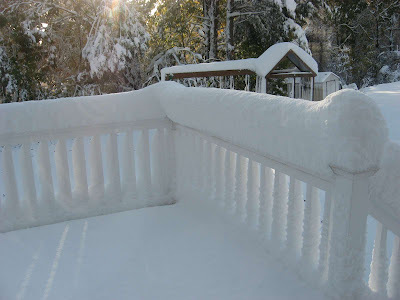 If the power went out during a winter storm...which it did often, we would push the refrigerator onto the porch to keep the food cold. Brings back memories. Hi Mary Grace. I'm not sure if there is any help for me as a knitter. I went to Noble Knits blog and copied the free pattern for the cowl. Looks like that wood be a great gift for my girls. Started knitting with a round needle and got about 12 rows done when something clicked. I forgot to join the round at the beginning. So is there any hope for me?? How do I know what size I'm using. My needles have no markings on them. Can you HELP! !